Donald Duck shirks his duties while working as a gift wrapper in a department store. Bellboy Donald's patience is seriously tested when Pegleg Pete and his son check in. Donald has a date with Daisy, but no money. He raids his nephews' piggy bank, but his guilty conscience catches up with him. Donald's cousin Gus Goose arrives unexpectedly. Despite the note from his mother saying "he don't eat much," he's soon eating Donald out of house and home. Daisy Duck: Temper, temper, shame on you. You never see me lose my temper, do you? 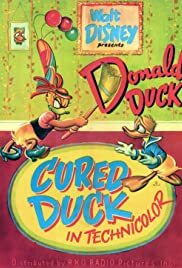 Daisy demands that Donald become a CURED DUCK - cured of his ungovernable temper if he wishes to keep seeing her. Any cartoon which has Donald's rages as its main theme has got to be funny, and this one certainly is. The Insult Machine (from the Tootsberry Institute of Temperism) is an inspired creation and worth of inclusion in the Duck's classic MODERN INVENTIONS (1937). Big Roy Williams, later one of the adult members of The Mickey Mouse Club on TV, scripted this film. Clarence Nash gives Donald his unique voice. Walt Disney (1901-1966) was always intrigued by pictures & drawings. As a lad in Marceline, Missouri, he sketched farm animals on scraps of paper; later, as an ambulance driver in France during the First World War, he drew comic figures on the sides of his vehicle. Back in Kansas City, along with artist Ub Iwerks, Walt developed a primitive animation studio that provided animated commercials and tiny cartoons for the local movie theaters. Always the innovator, his ALICE IN CARTOONLAND series broke ground in placing a live figure in a cartoon universe. Business reversals sent Disney & Iwerks to Hollywood in 1923, where Walt's older brother Roy became his lifelong business manager & counselor. When a mildly successful series with Oswald The Lucky Rabbit was snatched away by the distributor, the character of Mickey Mouse sprung into Walt's imagination, ensuring Disney's immortality. The happy arrival of sound technology made Mickey's screen debut, STEAMBOAT WILLIE (1928), a tremendous audience success with its use of synchronized music. The SILLY SYMPHONIES soon appeared, and Walt's growing crew of marvelously talented animators were quickly conquering new territory with full color, illusions of depth and radical advancements in personality development, an arena in which Walt's genius was unbeatable. Mickey's feisty, naughty behavior had captured millions of fans, but he was soon to be joined by other animated companions: temperamental Donald Duck, intellectually-challenged Goofy and energetic Pluto. All this was in preparation for Walt's grandest dream - feature length animated films. Against a storm of doomsayers, Walt persevered and over the next decades delighted children of all ages with the adventures of Snow White, Pinocchio, Dumbo, Bambi & Peter Pan. Walt never forgot that his fortunes were all started by a mouse, or that childlike simplicity of message and lots of hard work always pay off.